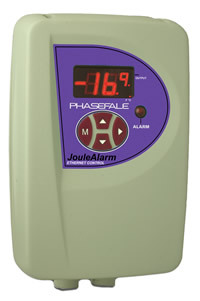 The JouleAlarm is an amazingly powerful yet compact unit ideally suited to alarm and monitoring up to 8 points and will find application in many different areas such as computer rooms, Elevator Motor Lift Rooms, fish breeding, Wine Room, Archival storage, mortuary, pathology fridges, holding tanks and various other process control and monitoring situations. Temperature monitor and alarm on up to 8 points. Real time Clock and alarm buzzer included. Digital display of temperature to 0.1°C, pressure to 1 psi, Humidity to 0.1%RH. 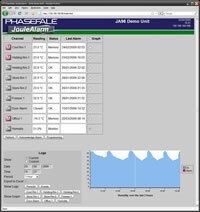 Complete alarm functions with 3 outputs, Email/SMS alarms over network. Based on our most successful JouleTemp with similar programming and same enclosure. Sensors ( not included) with 6m lead can be extended to 100m. psi or bar pressure range ( 0-100psi or 0-500psi).